Brand: Wilton 609-100 Units: 1 set/ 5 pens total Use like ink markers to add fun and color to countless foods. Decorate on fondant, run sugar, royal icing directly on cookies or any edible item with a solid surface. Includes yellow, green, red, blue, and black. 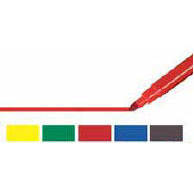 Please note: These markers have the same tip as Foodoodler's markers, item #PLP-F21102, PLP-F51105, PLP-F81108. Use like ink markers to add fun and color to countless foods. Decorate on fondant, run sugar, royal icing directly on cookies or any edible item with a solid surface. Includes yellow, green, red, blue, and black. Ingredients: Purified Water, Propylene Glycol, FD and C Blue 1, FD and C Yellow 5, FD and C Red 40, FD and C Red 3, Citric Acid, Sodium Benzoate (Preservative).